Trenton, N.J. – Mercer County Community College (MCCC) will launch its first full year of courses in Security Systems Technology (SST) this fall. Taught in partnership with the Security Industry Association (SIA), this new A.A.S. degree program prepares students for jobs that support the selling, installation, management, and technical support of physical security systems technologies in an IP-based net­worked environment. The 200-level course for Fall 2016 is Physical Security Product Technologies (SST 200), which will be held on Fridays, starting Sept. 2, from 1 to 4:30 p.m. A second new course in Electrical Wiring and Cabling (EET 141) will be offered in the spring. Says MCCC Program Coordinator Jeffrey Weichert, “In these times, improved security is on everyone’s mind. Our students will learn to assess the needs of homeowners, business owners, churches and public entertainment venues for weaknesses and make proposals to implement solutions.” He notes that salaries are expected to top $60,000 for students who earn this degree. Students will earn a total of 66 credits for degree completion. Among the program’s other courses are Routing and Switching Essentials, Fiber Optics, Scaling Networks, Security Project Management, Network Security, Systems Integration: A Business Blueprint, and Security Sales: The Consultative Approach. Courses will be offered at MCCC’s West Windsor and James Kerney Campus in Trenton. A specially designed high-tech lab has been developed in a new building at the Trenton campus for hands-on courses to be taught by industry professionals. Upon earning their associate degrees, students will be able to configure and install physical security hardware and software, cameras and optics, access control systems, video man­agement systems (VMS), and fire and burglary systems, as well as perform control station monitoring. They will also have expertise in physical security practices and procedures, computer network protocols and standards, and printed and online technical documentation. Weichert adds that students excelling in the program may be eligible for internships with physical security product manufacturers, system distributors, and systems integrators. A capstone assignment during the final semester will allow students to participate in the design and implementation of a real-world security solution. 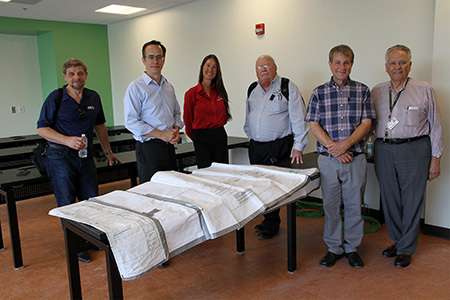 On site as the SST lab nears completion at MCCC's Trenton Campus, from left, Naum Schwartzman, AXIS Communications; instructor James Marcella, AXIS Communications; Sherinda Barrow, Open Options; and Roscoe Coffman, Open Options; and MCCC Professors Jeff Weichert and Dom DeFino. 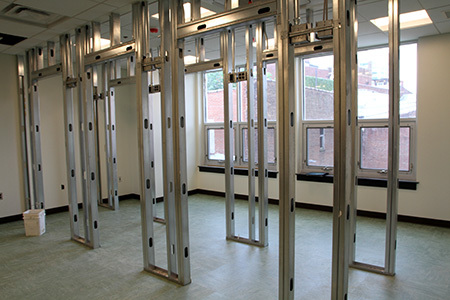 Once completed this fall, the lab will include doors equipped with state-of-the-art security technology, providing a hands-on learning experience for students. 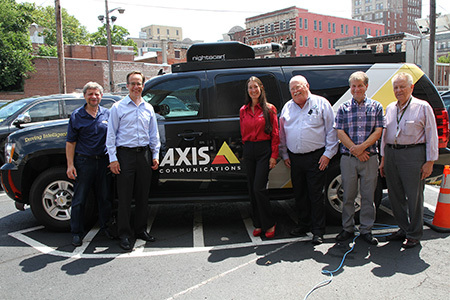 Prospective students had a chance to see an AXIS Communications van up close at a recent open house. The company's James Marcella, second from left, will teach Physical Security Product Technologies (SST 200) this fall. Graduates will be prepared to take the Cisco Certified Network Associate (CCNA) and CompTIA Security+ exams. To learn more about this program, contact Professor Jeff Weichert at 609-570-3347 or email weicherj@mccc.edu.